With the release of Teflon Don looming just over the horizon, anticipation for Rick Ross's fourth album is at critical mass. While his lyrical content reveals an insatiable taste for the high life, the gradually improving quality of his music suggests an artist with an increasingly high standard for himself. Not satisfied with the warm reception given to last years Deeper Than Rap, Rick keeps reaching for the stars. 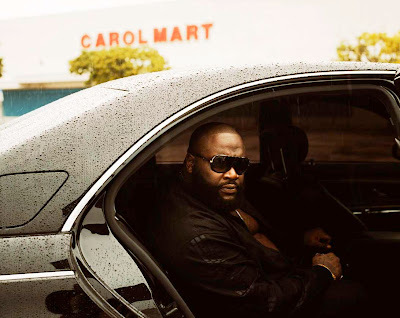 The recently leaked "Maybach Music III" shows that his grasp is at least equal to his reach. Lush violins during the intro prepare us for the dramatic composition that awaits. The track is not bound by the rigid confines usually imposed on Rap music. The arrangement feels loose and free flowing as opposed to being chopped and looped into a precise pattern. Stylistically, no coastal or regional influences are apparent. The breezy, symphonic arrangement blends together effortlessly, making love to the ear drums. It opts to entice listeners as opposed to bludgeoning them into submission. The bass line is reminiscent of Micheal Jackson's "I Can't Help It", or at least the portion used by De La Soul for "Breakadawn". The Line up is in keeping with the regional anonymity of the production itself. T.I. delivers a generic and indistinct opening verse. Erykah Badu's soft, Jazzy crooning melts into the crevices of the track like warm butter. Jadakiss combines ferocity and smoothness in equal measure. Unlike T.I, he remains firmly and comfortably "in character" for the duration of his verse. The arrangement switches gears for the finale, building to an even more dramatic and ominous tone. One could imagine flashy pyrotechnics accompanying Ross's stage entrance during a live performance. In fact, the song seems geared specifically for concert halls and outdoor arenas. Rick Ross has an impeccable taste in beats. With each subsequent entry into the "Maybach Music" cannon, he and The J.U.S.T.I.C.E League come closer to perfecting a formula that was nearly flawless to begin with. Unlike many of his contemporaries, Ross seems to understand that the key to longevity isn't just great marketing but also great music. Though his high level drug dealer persona might be a complete fabrication, he definitely believes in the same business model as Leroy "Nicky" Barnes: Provide your clientele with the best quality product possible and they will keep coming back for more.